New handmade oil perfumes and toxic free nail polishes at the studio! Renee Van Dohren has joined us and we are so thrilled to have her as part of our team. She joins Esme and Estrella, and together they cover shifts from Monday through Saturdays at our boutique salon in the exclusive Marina del Rey, just a few minutes from Abbot Kinney. Renee naturally has the same style as owner Esme and Advanced stylist, Estrella. They focus on precise application, enhancing the clients natural features using top quality lashes and glue. Below is a beautiful example of her work, giving the client drama but still creating a fluffy and soft look. All of their clients look for a certain level of quality for beauty services, and they cater to a lot of behind the scenes women working in the entertainment industry as well as a few high profile actresses and musicians. We really are excited to have Renee as part of our specialist team and look forward to you all meeting her! "Lash and Brow Restoration" Coming Soon! Ladies, we at the Esme Winterflood Lash Studio are often asked these days about Microblading. This technique is a much less invasive procedure then the traditional permanent tattooing. The strokes are delicate and ideal for adding shape and definition to your brows without trauma to the skin. Over the years we have earned our place on the Westside as specialists in creating lash looks that are natural yet enhanced, comfortable and long lasting. We are really excited to offer a similar semi permanent treatment for brows, focusing on just enhancing your own shape and filling in areas where your hairs may be thinning . The two treatments will be available to purchase as a package. Keep updated with our website for offers ! The Fabulous Women's Guide Through Cancer. Welcome to the Virtual Tour! Hello friends! This is an introduction to a fabulous book for fabulous women. It was written by my friend Nicola Bourne. Nicola battled cancer and since has written a book of memoirs, stories, tips and tricks for getting through each stage of the experience. I am so proud to be part of the book, sharing my eyelash advice for women going through the big C. So many of us have up close and personal experience of this disease yet, one can still feel so alone. This book gives comfort and hope to women and their families about how to approach the children, how to have a social life when you have no energy and the emotional effects of cancer. My excerpt contributes to the beauty part of the book (please see below) and I shared my advice with the talented, industry famous makeup artist Tracey Gray Mann. Please read, share and enjoy. Losing your lashes is one of the big visual reminders of cancer, and of course it's actually the chemo that causes the hair to fall out. I have had a couple of women wanting to do lash extensions whilst they have chemo, but because the extensions are attached to the lashes themselves and not the eyelid, the extensions will simply shed with the lashes. Whilst you go through chemo, applying semi permanent strip or cluster lashes is your best option. The good news is that once you finish treatment and your hair starts to grow again, you can do a few things. Latisse is the strongest prescription lash conditioner and although it can irritate sensitive eyes, it really works to speed up lash growth and health. I have seen amazing results! Once a clients lashes start to grow back in, we start by using very fine extensions (real mink lashes are great). By enhancing your lashes, women find they start to look like themselves again, their eyes look defined and bright and most importantly, they get their confidence back. The lash conditioners start taking noticeable effect after about 5-6 weeks (the full length of a natural lash cycle) and we can start putting on slightly thicker or longer extensions as time goes on. After some months, I recommend the client begin using a less powerful lash conditioner and just a few times a week rather than every night. You can still apply the product on the lash line whilst wearing extensions, just not in the first 24 hours while the glue on the extensions is bonding. I usually stock Nouriche (it used to be called Revitalash) because it is slightly less powerful but still works well and if you are looking for an organic product, Lash Food is a good option. These brands also offer brow conditioning products, so if your brows have also thinned out you can apply the brow conditioner every night (and then after 5-6 weeks go down to a few times a week). These products aren't cheap but they work amazingly! Once your lashes are back to normal, most people like to continue with their lash extensions but you can also do a lash lift which is more low maintenance (it's like a modern day lash perm but looks much better!) or even just a lash tint. Visit Esme's website esmewinterflood.com for more information about lashes and services. " MINK STRIP LASHES- WHAT'S THE DIFFERENCE TO REGULAR STRIP LASHES? Mink lashes are a really luxurious choice of fake lash. When minks used for lash extensions, we have found their staying power isn't always as great as synthetic silks (our favs!) because the shaft of the lash can be somewhat irregular and therefore not adhere to the natural lash as well. BUT, if you are looking to buy a strip lash for one off occasions, then we think minks are the way to go. They might be a bit more expensive but you can peel off the glue and reuse, (be sure to keep the box they came in so they're kept clean in the mean time). Minks- and we're talking real mink fur here- will be soft, fluttery and you'll avoid looking like daisy the cow or a drag queen. Which is fine, but it's not for us! Two Fab brands going through our "test bench" ! Last week Esme and her in house facialist and friend Nina Davis attended the International Spa and Esthetics trade show in Las Vegas. We wanted to do a little write up on the two skin care brands that stood out the most. Although the two brands are different in philosophy and style, we’re really impressed by elements of both of them. Enjoy! “Use premium organic and natural ingredients for long-term beauty resolutions.” As a local business in the organic, health conscious capital of the United States (Los Angeles) they take pride in keeping ahead of the industry with their continuous research and drive to improve. We’re always on the lookout for the latest, healthiest and most natural ingredients to combat the negative effects of external and internal factors on the hair, face, skin, nails and overall health. Their motto: “To offer quality, natural products with exceptional beauty results. 100% Customer Satisfaction along with 100% Money Back Guarantee”. - More similar to a good and accessible brand aimed at teenagers like “NIP+FAB” but not your luxury brand. Lucrece Physicians’ Aesthetic Research, Inc. (LPAR) was established in San Clemente, California in 1993 by a team of professionals consisting of a dermatologist, an aesthetician and a cosmetic surgeon to develop professional skin care products for anti-aging and hyperpigmentation. Those Skin Care products are formulated with scientifically tested ingredients dedicated to the latest anti-aging skincare research and development, ensuring that the products contain the most advanced ingredients and formulas available in the skincare industry. Lately, we've been inspired by the healing properties of crystals. Esme recently happened upon a rock and gem exhibition during a visit to the lovely Paso Robles and bought some new pieces to the studio. They say that the crystals you are particularly attracted to, possess the metaphysical properties you are in need of. For example, the Amethyst crystal represents meditation and will help to stimulate and soothe the mind and emotions. So if you find yourself drawn to the amethyst, perhaps you need to pay attention to this area of your life. This stone is very popular not just because of its striking beauty but it also has a high spiritual vibration. 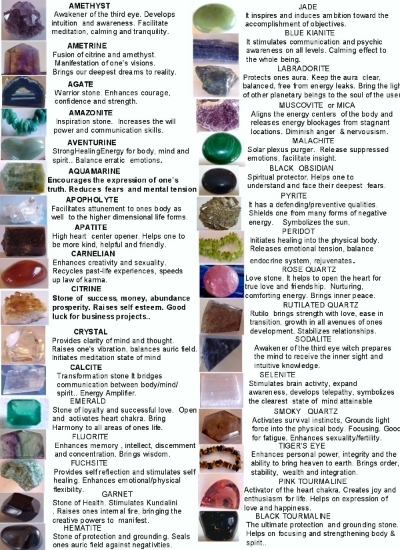 See the chart provided to learn more about the properties of each crystal. Try a crystal on yourself (Let it float around your wrist or hold it in your hand and feel, with your eyes closed, if energy is flowing), some will have more effect than others on each individual. We have also been enjoying the philosophical and spiritual books at the emporium that is the Mystic Journey Bookstore down the road on Abbot Kinney. Mystic journey has a really great variety of books about astrology, spiritual healing, tarot reading and much more. They also do weekly events and readings. Go visit! Ruth, the owner, is an extraordinary Shaman/ Healer and will read into you as quickly as a newspaper's headline, as well as help you choose the right items you are looking for. We highly recommend! Share your experience on Crystals with us, and 'Namaste'! 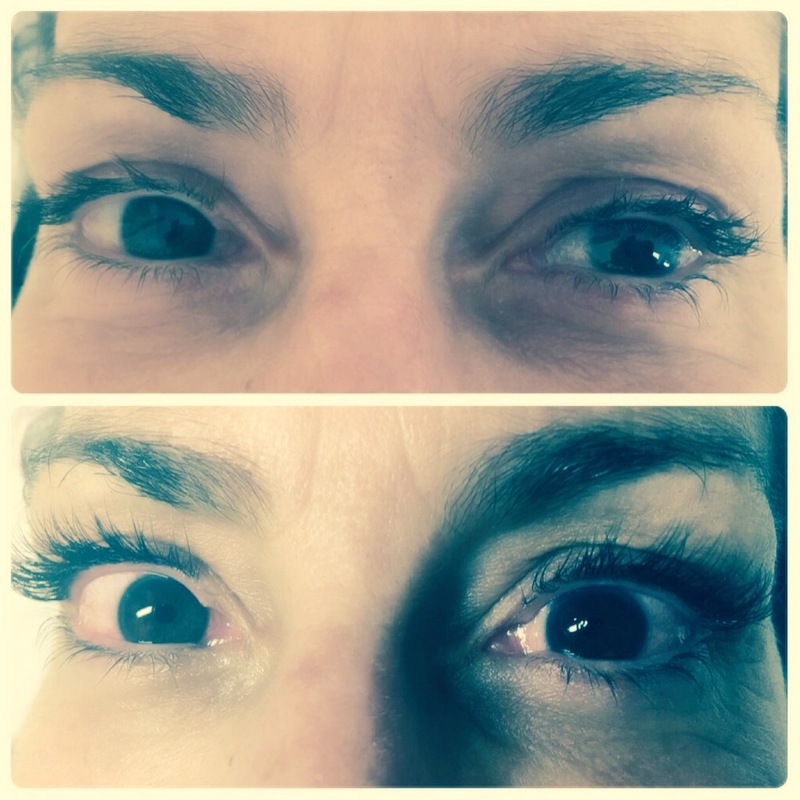 "WHAT IS THE LASH LIFT?"... We hear you asking ! The lash lift is becoming very popular and is a great low maintenance alternative to extensions. It won't give you extra fullness or the ability to change the length or shape of your natural lashes, but by lifting the natural lashes up we are framing the eyes and giving them definition that otherwise, we would not be seeing. The modern lash lift uses a soft silicone pad that we attach with a skin friendly glue to the eye lids and then we lift up the natural lashes first with a perming solution then with the setting solution. The last step is a nourishing oil to dissolve any residue glue and feed the natural lash. This treatment really works for people with already fabulously long lashes who want to stop using a lash curler every day. And those clients with short lashes will find the lift allows us to see what lashes they do have and will find great results combined with daily mascara. Talitha Getty with her husband J.Paul Getty Jr. on the roof of their Ryad in Marrakesh in 1969. As Venice Beach residents or aficionados, we know very well that we cannot stroll down Abbot Kinney without stopping by the wonderful gem of a store that is Principessa! We love investigating the new seasons clothes and jewelry, they often have a great sale rack for a cheeky purchase. The store carries a careful selection of amazing clothes, vintage items and accessories, infused by a Gypsy-deluxe Bohemian look, initiated by Talitha Getty, the famous 60's Fashion icon and wife of philanthropist and oil tycoon’s heir, J.Paul Getty. But one of the first reason we all fell in love with that store a few years ago is because of their astonishing choice of "Heaven" musks, made of organic essential oils, that changes your body chemistry and make people (and men) crazy!! The first we discovered was the unbelievable "Essential Faith": a petite roll-on that lasts for months and is definitely a "turns-heads"! The price at $90 and could be dissuasive, but it is a truly luxurious scent that’s worth it ! (Apparently the effect of this Musk really depends on people and you should try it on your skin first before making the big purchase). Principessa Venice recently introduced the "Tulum oil", a unique and magical oil from Mexico combining notes of amber, sandalwood, and Caribbean floral. Price ~$42. It is half of "Faith oil" price but for some of us who have tried both, it is half of the magic as well... Despite being also a rare and unforgettable perfume ! And we’re extra excited to have just found their new store in Paso Robles where the owner frequents and is bringing a little Abbot Kinney to wine country. Bliss! Why see our Junior Lash artist Petal? Here is why! Trained at the renown JB Lash Institute, Petal recently added the Volume training Lashes to her impressive resume. She has been a colleague of Esme’s since they trained together at beauty school. As well as being a talented Brow and Lash artist, Petal enjoys acting in theater productions and understands all the beauty tricks and tips of the "Industry". Clients love her not only for her personality but also and foremost for her amazing work. As you can see on those Before/ After pics below, she is a talented lash artist who aims for perfection. Do not miss: Esme's weekly tutorial! This week, she explains us why 3-D volume Lashes are so much easier and beautiful and revolutionary! 3D volume lashes are becoming very popular and this new technique has had a big impact on the developing technology of lash extensions. Most lash techs will initially learn to pick up single .07mm diameter lashes with curved tweezers, fanning them out at the top, and coming together perfectly at the bottom. However, I found using pre made volume lashes to be far easier, helping me with a quick & perfect looking application. The resulting look for the client is exceptional fullness, while still looking soft because of the fine diameter of the extensions. This is a great way to give a client lots of volume without becoming heavy or weighing down on the natural lash. — Esme Winterflood, Lash Artist and Studio owner. Esme and her team have been advising their clients for years to use Nouriche! A luxurious serum for your lashes. Enhances the look of your Lashes so they appear lush and luxurious. Helps provide the appearance of stronger, shinier-looking lashes. Gingko Biloba helps protect lashes against environmental stresses. Nouriche Eyelash Conditioners are on sale at the Studio! And for every product buy, you get a free Hi-Def Tinted Brow gel from Revitalash Cosmetics! Esme fell in love with that softy and elegant rug. We also added a huge mirror on the wall to create some space and so you gals can check out your gorgeous lashes.
" Be yourself everybody else is taken." Esme and I love Oscar Wilde so we had to frame our favorite quote ! What's best than LondonTown for the Holidays!! As we all know, Esme is the more British of the Brits! As a matter of fact, she enjoys coming back to her roots with her husband and baby as often as she can! Her most recent trip was this last holiday season, and we are not going to lie: London and its beautiful countryside area are the absolute best around Christmas time! In Amy's Winehouse footsteps: the most famous and talented British singer left us heartbroken in 2011 , and Esme loves to visit Camden town, as they were neighbors for a few years! Another of Esme's favorite pass-time when she come visits her gorgeous homeland is to walk around the Thames and stare at this unreal sunset over TowerBridge! Lauren, our manager and assistant, spent a couple of years in London as well, in her early twenties, and seeing Esme going back there often definitely gets her nostalgia (and envy) level very high! She remembers particularly her days walking by the Thames river from Waterloo Station, where she used to live, to either the lively and touristy Covent Garden, or to the Tate Modern, one of the most famous museum that contains one of the richest collection of Modern art in the world. One can lingers there for an entire day and finish on the Millenium Bridge admiring St Paul Cathedral. - Venice Beach has become THE place to be if you have vibrant an authentic beauty brand! Special mentions to our friends at Spa Sophia, and Kelley Baker Brows! - When luxury meet hippie cool chic! Abbot Kinney is overflowed with the coolest designer brands! Lf for the more reckless fashionistas, Ananda for the hippie cool, Principessa for the elegant ladies, and now our sister from London , Sweaty Betty, who made it all the way to Venice like us :) ! -and lets not forget the most important: The food!!! Venice and the Marina welcome the best of of the "Boutique restaurants" for everyday foodies' taste of Los Angeles! The pioneer Gjelina of course on AK who hasnt disappointed us since its opening (Who hasn't craved their gruyere /caramelized onions pizza or their infamous dessert the butterscotch pot-de-creme? :), and our next door neighbor Scopa who offers best wines ( special mention to Esme's friend sommelier the lovely Taylor) and cured meats! Every newcomers in the area remind us we are in the right Spot! The beachy and delicious Simmzy's by the Pier and its hallucinating beers selection, and least but not last, the exciting Leona and its progressive California Cuisine that sees a long waiting-list every night, and that we have yet to try!! And you, what are you best spots in Venice? What to do with your kiddos this Summer in L.A? Get up close and personal with a single work of art at this half-hour, hands-on gallery experience geared toward families with children ages 5 and up. Sign-up begins at 11:00 a.m. at the Information Desk. Santa Monica Place Kids Club takes place the first Wednesday of the month, with host Miss Claire, who entertains and educates kids with a mix of puppet time, music time, story time and crafting fun. One of the most beautiful spots in the State is right in our backyard, at the Huntington Gardens & Library. It’s got a fabulous (and wet!) kids area, beautiful gardens for strolling through, a tasty tea house, an world class art collection – in short, it’s a perfect place to spend the day exploring with kids. Don’t forget blankets, sweaters, chairs and a picnic to while you lounge on the grass and listen to the jazz…and arrive early! when: every Thursday at 1 p.m. to 3 p.m. The Norton Simon’s Thursday Summer Fun series allows kids – with the help of an educator – to discover the museum’s paintings, sculptures or prints during themed afternoons, and the get hands-on to create original artwork. Let us your comments and share with us the cool things to see, eat, make and do with your kids in your neighborhood this summer!! Forget mascara, get a Lash Lift! You think Lash Extensions maybe be too high maintenance for you? You should try a Lash Lift ! Technique that uses your natural lashes to make them look longer and thicker. Lift your lashes from the lash line. A modern day take on the Lash Perm. Our tip: Add on to your Lash lift treatment a Lash tint for an even better looking result! The wonderful people at FAB FIT FUN, a fabulous online magazine that gives readers the latest and greatest in beauty, wellness, health, fitness, and fashion, have shown their love for The Esme Winterflood Lash Studio and we love them back! A long way to go for women...and their confidence. Hope you enjoy and it and share with us your thoughts! Guess who is the Celebrities favorite Lash Artist ? Eye Lash Magazine, the media devoted to the newest trend and whom mission is to educate and inspire salon owners, lash specialists, estheticians and makeup artists on the latest trends and products for creating beautiful eyes, recently interview Esme about Trends, Must-Have products and how to create the ultimate customer experience! Check the article here! All the images used in this template are the property of Esme Winterflood and used with permission. Winterflood is a lash veteran, known internationally for her delicate and precise application. A trained Editorial & Celebrity Makeup Artist, Esme creates stunning looks for her clients and is now offering the latest trend sweeping Europe, and previously unavailable in LA - the '3D Volume technique'.